With facilities for children and the less able, and a whole host of special events, English Heritage make a good job of marketing their properties. It's well worth checking out the website to see what special events are taking place before you visit. For 600 years Dartmouth Caste has stood in a superb waterfront setting at the narrow entrance to the Dart estuary. Its gun tower was probably the first in England purpose built to mount heavy cannon. See these guns today and imagine the strength of a counter attack as they fired across the water. 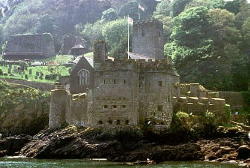 With plenty to see and appreciate from the Middle Ages, Tudor period and Civil War through to World War 2, Dartmouth Castle is a delightful day out for all the family. What's more, it's an ideal spot to watch the river and picnic in breathtakingly beautiful surroundings. 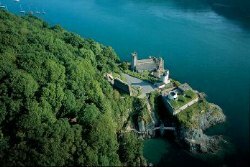 Discover tales from the castle's 600 year history, experience the sights and sounds of the great guns in a fully recreated Victorian gun battery, and from the castle's battlements, enjoy splendid views of the Dart estuary, where ships have set sail from the time of the Crusades to the D-Day landings. Before you leave, browse the excellent gift shop, full of great books, gifts and toys, a fine selection of jams and chutneys and a luxury range of period bath oils and lotions. You can complete your stay with a visit to the church and the Lighthouse Tearoom. Why not travel to the castle by Water? Take the Castle Ferry from Dartmouth quayside along the banks of the River Dart to the landing stage close to the castle. 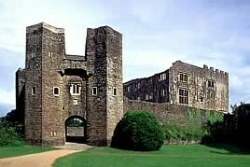 Set in beautiful woodland, the castle is truly romantic and reputedly the most haunted castle in Devon. These pretty ruins were once a dramatic medieval castle and superb Elizabethan mansion, former homes of the Pomeroy and Seymour families. You can stroll through the peaceful ruins of what was once one of the finest houses in Devon and discover the castle's intriguing history with an audio tour as you let the children explore the ruins and thrill to the sinister legends surrounding the castle. To make a perfect day, bring a picnic and enjoy the glorious surroundings, before you finish your visit with a look in the gift shop or afternoon tea in the tearoom. 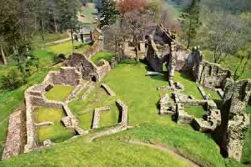 Okehampton is one of the country's most picturesque castle ruins standing in a stunning setting amid the foothills of Dartmoor. 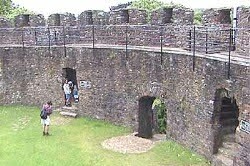 Once the largest castle in Devon, it is mentioned in the Domesday Book. Take an audio tour and transport yourself back to a bygone age as you explore the former home of one of Devon's most powerful families, or picnic by the river and enjoy the pretty woodland. If you come in spring, the ground is awash with wild flowers and you can join us for our annual bluebell walk. The castle is the focal point for the delightful town of Totnes and stands as a mighty legacy to the power of the Normans. 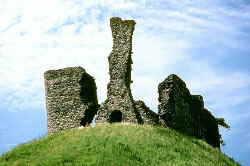 It is one of the best surviving examples of an early Norman motte and bailey castle. 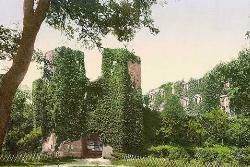 The once great moat that surrounded the castle is now filled with the cottages and gardens of the town. 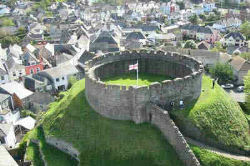 The castle has amazing views of Totnes and the River Dart from the castle keep. You can make a day of it and take a ferry trip along the beautiful River Dart to Dartmouth or join the steam train for a trip to Paignton!